MEXICO CITY, Jan 3 2018 (IPS) - The first few months of 2018 will be key to defining the future of the North American Free Trade Agreement (NAFTA), whose renegotiation due to the insistence of U.S. President Donald Trump has Mexico on edge because of the potential economic and social consequences. After five rounds of ministerial negotiations, which began in August, the three partners in this free trade bloc in force since 1994 – Canada, Mexico and the United States – have disclosed that little progress has been made in the talks marked by rigid positions, tension and secrecy. “The United States has stuck to its initial stances, aimed at reducing the trade deficit with Mexico and Canada. But Canada and Mexico do not accept these positions,” said Arturo Huerta, an academic at the Faculty of Economics of the National Autonomous University of Mexico (UNAM). The expert told IPS that “Mexico has been continuously yielding, with a view to getting the United States to stay in NAFTA, while Washington…will continue trying to get as much as possible and if it does not get the main things it wants, it says it will pull out” of the treaty. Of the 30 chapters that are being discussed, so far only two have been concluded: small and medium enterprises and competition. On Nov. 22, the Mexican Ministry of Economy reported that the negotiations were moving ahead on issues such as anti-corruption, telecommunications, trade facilitation and e-commerce. 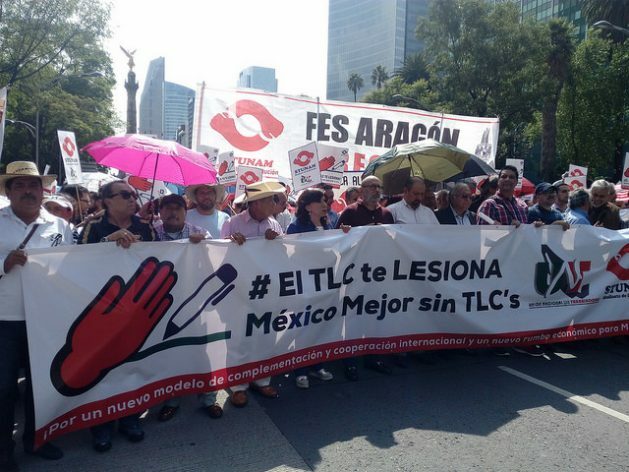 But labour issues, such as closing the wage gap between the partners; rules of origin, which stipulate the mandatory regional content of each product; dispute resolution mechanisms; intellectual property and possible quotas for agricultural exports, especially for Mexican fruit and vegetables, are stalling the debates. Priorities for the United States include new phytosanitary measures, greater protection for intellectual property, labour and environmental measures and the possible elimination of the dispute resolution chapter, which establishes special panels to address unfair trade practices. Meanwhile, Mexico’s focus is on energy, e-commerce and small and medium enterprises. For its part, key issues for Canada are the inclusion of labour, environmental and gender standards, increased migration flows, indigenous peoples, the revision of the dispute resolution mechanism and a more open government procurement market. The United States proposes that NAFTA be automatically terminated every five years, unless the three countries agree to extend it. Mexico suggested instead a five-yearly review. The talks, which the ministers agreed to resume on Jan. 28 in Montreal, Canada, also cover topics not included in the original text, such as energy, e-commerce and digital activities. For Steve Suppan, a policy analyst at the U.S.-based Institute for Agriculture and Trade Policy (IATP), the new free trade agreement will involve the entry of genetically modified organisms and synthetic biology products, technology based on gene trimming without the need to inject genes from other organisms. In 2013, a Mexican court ruling banned the planting of GM corn, although imports are allowed. “The United States has decided not to regulate grains and vegetables designed with new techniques” which would be included in the free trade agreement, he told IPS from the Institute’s headquarters in Minneapolis, Minnesota. For Mexico, automotive manufacturing, “maquilas” or for-export assembly plants, agroexports and financial services are among the sectors that benefited from the 23 years of free trade between the three countries. According to academics and activists from the affected sectors, the big losers with NAFTA are small-scale farmers, including producers of the staple products corn and beans, and the food sector in general. They also demanded changes to the legal framework of the national agro-food system and for the implementation of programmes that promote traditional agroecosystems, diversification of production, native agrobiodiversity, community funds and seed fairs, tianguis (street markets) and local markets. They also asked for the participation of peasant farmers in designing these programmes – another example of the mobilisation of civil society to press for a treaty that benefits people rather than corporations. NAFTA drove up Mexico’s trade dependency on the U.S., which purchases more than 80 percent of this country’s total exports, while Canada purchases approximately five percent. With both countries, Mexico enjoys a trade surplus. So far, studies of the possible consequences of the renegotiation or withdrawal of the United States from the agreement have come mainly from that country. Three recent studies, commissioned by the Congressional Research Service (CRS), in the U.S. Library of Congress, outline several scenarios. That would mean a loss of competitiveness for U.S. products, it adds. Most-favoured nation refers to a country that has been granted the most favourable trading terms available by another country. Other potential impacts could include higher prices for goods imported from Canada and Mexico, reductions in agricultural imports that compete with U.S. products, supply chain disruptions and positive and negative effects on agricultural producing states. “Mexico will have to give in, for the United States to not withdraw from the agreement. For Mexico, it is very important to uphold the trilateral agreement, to allow foreign investment to keep flowing into the country, in order to export to the United States,” said Huerta. “The negotiations could lead to more lengthy talks, a stalemate, maintaining NAFTA as is, or a possible withdrawal from the agreement,” says the CRS analysis. Shooting ones self in the foot seems to be the direction being taken here. One position that has emerged, that being the U.S. demand for changing what it created. The present position of the U.S. government toward trickle down economics instead have the opposite effect, that being higher prices for the consumer. The U.S. playing the losing colonial card, is obvious to those who watch such things.